Discussion in 'Vaping Related But Doesn't Fit In a Category' started by grobbins, Jun 25, 2014. gadget!, Heartsdelight and midknight420 like this. SnapDragon NY, gadget! and Heartsdelight like this. Batteries from 18650BatteryStore and Orion Q from MyVPro, charging it all now! SpectoVia, SnapDragon NY, BobsHere and 4 others like this. Vape Fan, SnapDragon NY, BobsHere and 8 others like this. Little goodie from the slow boat. It will make a nice flavor testing RDA. Really surprised for the $5 I paid for it. It's nice. It came with a ss drip tip, which of course gets stupid hot. I had this little white one that looks good with it. SpectoVia, nadalama, SnapDragon NY and 8 others like this. Vape Fan, SnapDragon NY, BobsHere and 6 others like this. Those PET bottles can be a real mess if they are hit just the right (wrong) way in transit. 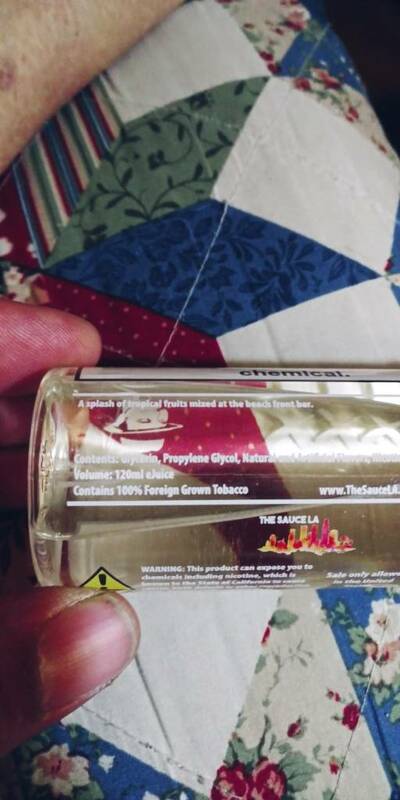 Wonder why it's important for them to specify the foreign grown tobacco thing. That's different. SnapDragon NY and Heartsdelight like this. So maybe we know it's not our US big tobacco making it? Lmao. Honestly the first time I've ever seen that. Black Squid Detonator and black/ultem Vapor Storm Raptor squonker showed up today, along with just a few flavors from BCF. Like both these mods a lot. For my hands the Detonator is about as comfortable as any mod I've had or used. It is solid, too, substantial. Right now the Detonator is "wearing" a single Zeus and the Raptor a VC Shogun. May put the Centaur RTA I got from @gadget! on the Detonator. Detonator is the most expensive mod I've bought. I hope it turns out to be worth the money. debinnv, SnapDragon NY, Bluenatic and 3 others like this. My SauceLA order came in today- so fast, ordered Friday shipped from Cali to NY and got it today! Wonder what happened to their free bottle- I didn't get any this order . debinnv, Heartsdelight, gadget! and 3 others like this. Heartsdelight, gadget!, nadalama and 2 others like this. I like both of those LOL! I use 1922 in my Nebox and Orion- love the fruit punch koolada flavor. They sent me Julius Orange the last time- I'm not an orange fan, I haven't tried it yet. Heartsdelight, MrMeowgi and nadalama like this. Sounds like you and @MrMeowgi should exchange your freebies with each other. debinnv, Heartsdelight, SnapDragon NY and 1 other person like this. A pair of 30Ts on the left (married for my tube stacks) and 20S on the right (married for dual 18650 mechs.) I just wrapped right over the factory wraps for the 30Ts. I wish I would have thought of that before doing the 20Ss. SnapDragon NY, debinnv, gadget! and 3 others like this. right on , man. glad your dig'n em. most of mine, I just went right over the orig wraps. Heartsdelight, SnapDragon NY and gsmit1 like this. oh, btw. the other 2, they will look much better when installed. They ARE really cool I didn't think of double wrapping them until I already had the first 20S done. Heartsdelight, SnapDragon NY and jinx'd like this. No they're cool too. I just want to determine what is the best use for them as an identifier too. One will probably go on the 20S for my ohm reader. the first set I bought, there was 1 of each style = should have bought 2 sets. a few of them I didn't like, but after installing them, they looked much better. if you want a quick fix, ebay. you will pay a little more, but get em quick. and much better to see what your getting. then slow boat after that. If you have a Batteries Plus store near you can drop them there. -Four, yes four Wotofo Elder Dragon RDA's. I guess I had two in my cart and added two by mistake. So two of these will be for sale soon. SnapDragon NY, SpectoVia, Vape Fan and 6 others like this. Huckleberried, SnapDragon NY, gadget! and 5 others like this. WOW! Ordered a Wasp nano RTA from Fasttech on 4/10 and it's already in the states. Tracking shows delivery on Friday 4/19. 9 days (including the weekend) from China to Houston via New York customs. That will be a record for me. First time one of my China orders has gone through New York customs. Usually goes through Chicago. SnapDragon NY, SpectoVia, nadalama and 7 others like this. SnapDragon NY, Theboss, Heartsdelight and 1 other person like this. Yea. Can't complain really with a sale like that. SnapDragon NY, Theboss, Vape Fan and 1 other person like this. Hopefully you get it that fast. Mine cleared ISC 4/10 and I'm 2 maybe 3 days max from that point. Just got it today. 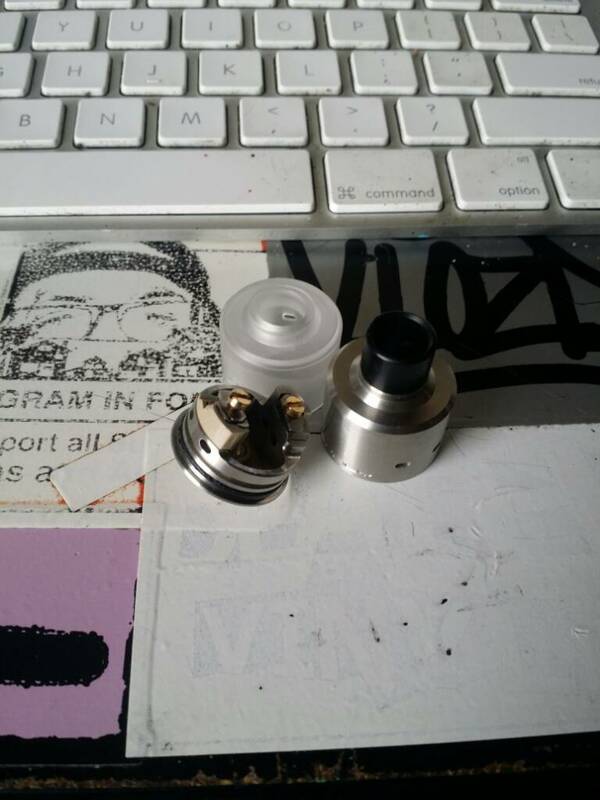 I ordered this bubble that fits Wasp Nano RTA separate from the tank because it wasn’t in stock. SnapDragon NY, DonBaldy, debinnv and 4 others like this. SnapDragon NY, debinnv, Nailz and 5 others like this. I have a Radius clone that I got from Aliexpress. Once I got that nuclear-hot drip tip off it, I just love it! 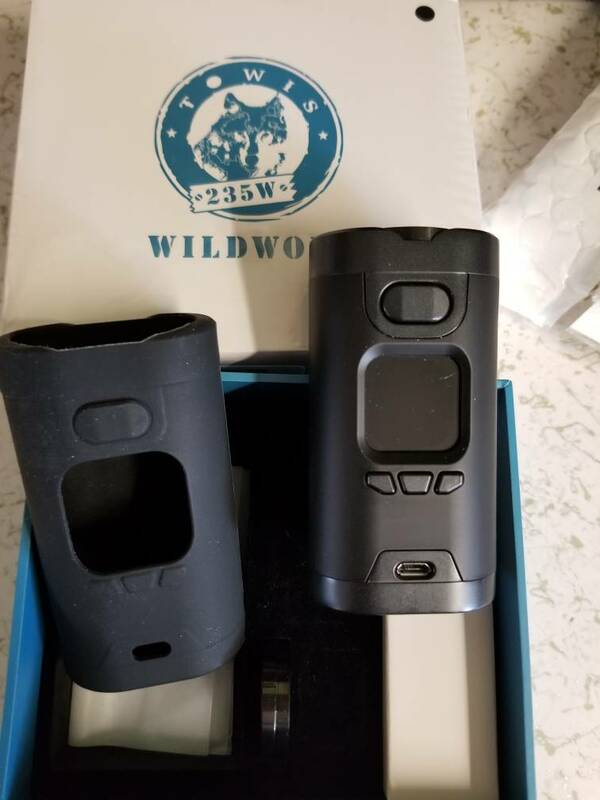 It lives on my Ram squonker and I use it all the time. SnapDragon NY, debinnv and Heartsdelight like this. Yes, this was a nice little surprise. Great flavor banger! SnapDragon NY, Heartsdelight and nadalama like this. I needed to get some new batteries to marry up for my dual battery mods and started to develop a wicked case of "what batteries do I choose and from who" OCD. After a few weeks of stupid indecision, Li-ion Wholesale solved my dilemma with a flash sale. Samsung 25r for $2.99 each. The sale is over, but the current price of $3.78 is still pretty good. I picked the slowest shipping method just so I would NOT get a fan (derp); Phoenixville, PA to Murfreesboro in 5 days. SnapDragon NY, debinnv, Countrypami and 5 others like this. SnapDragon NY, Garemlin and Heartsdelight like this. $8?? Wow!!! I didn't think they would go much lower. When I bought my first one for $18 I thought that was a deal. The last three I bought were $12.50. I think I'm good at four. SnapDragon NY, Heartsdelight and Countrypami like this. Yeah, I was shocked too. Of course I had to jump on it. SnapDragon NY, Heartsdelight and Garemlin like this. 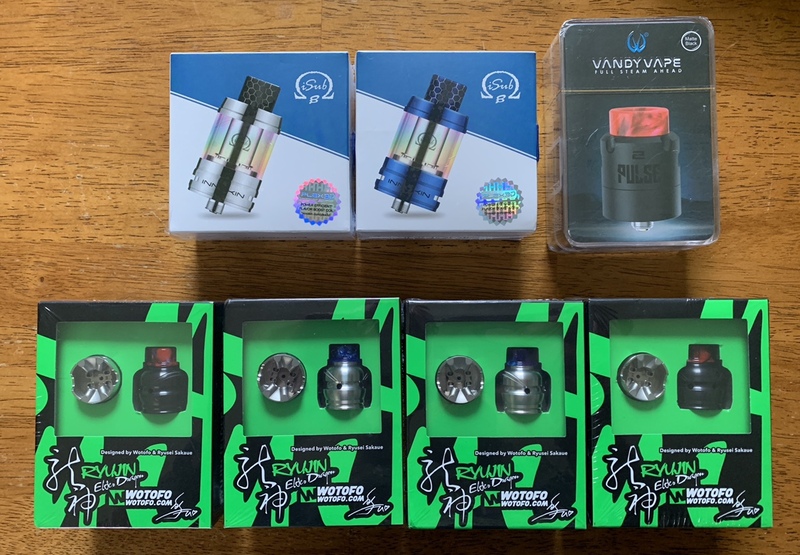 I bought some of the regular iSub coils to try eventually. The Plex3D mesh coils have great flavor. But they are juice guzzlers. When I got them for $12.50 it was shipping from their US warehouse. Looks like it is only from China. And SS is sold out. I think I'm one of the few that really likes the original isub tanks. I've been using them for years. That's a coil I always have on hand so I figured if I don't like the mesh I can at least still use the reg. coils in them. I never tried any of the other iSub tanks. I've been hooked on my Melo 3's for the last few years. When I watched the rave reviews and saw the price I had to give the B a try. I've since sold off all but two of my Melos. Not surprised. Their prices go up and down as much as amazon. SnapDragon NY and Countrypami like this. I have a couple Melo 3's. Didn't like them as much as my Kangers. SnapDragon NY and Garemlin like this. I thought the flavor of the Melos was so much better than my Subtanks. And the coils lasted forever. Oh and be careful when filling the iSub B tanks. When you take the top cap off there is nothing holding the glass on. I've never had an issue but it could be easy to bump the glass off and spill the juice. Not the most ideal filling option. But I think it is necessary with the way the juice cutoff works. Upgrade to my mixing, seen these scales recommended the most from DIYers, hoping to make mixing less of a chore with less clean up. SnapDragon NY, debinnv, jinx'd and 5 others like this. DonBaldy, SnapDragon NY, debinnv and 6 others like this. that thing makes mixing EASY, and no cleanup. SnapDragon NY, Nailz, Heartsdelight and 1 other person like this. gadget!, Heartsdelight, Theboss and 3 others like this. jcash74, gadget!, DonBaldy and 3 others like this. Mail from @Heartsdelight fastest transaction I've ever had! gadget!, Heartsdelight, MrMeowgi and 6 others like this. Yay!!! You got it! Hope you enjoy it. We need to see it with your Plus! SnapDragon NY, gadget!, Vape Fan and 2 others like this. Lol I took a pic maybe 10 seconds before you posted that. SnapDragon NY, gadget!, DonBaldy and 5 others like this.